Total Area: 1657 Sq. Ft. 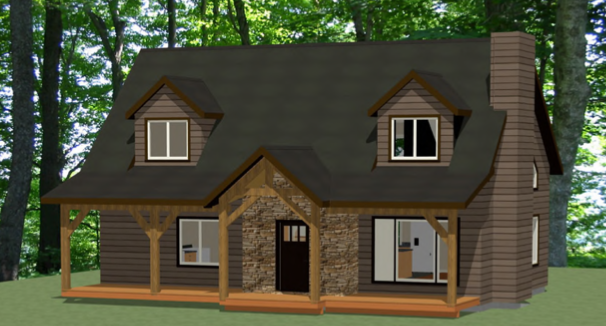 Originally designed as a back lot cottage plan, this 1,657 square foot timber frame could easily work as a house design also. This three bedroom, three bath design is the little brother of the Summit and has a great layout. Walking up, you immediately notice the timber frame covered entry and porch which ties the outside look of the home to the inside. Walking through the front entry, the room opens up into the great room with 20 foot vaulted timber ceilings that carry right over top of the 2nd floor loft. The timber dormer in the great room shows off the joinery and adds natural light to the room. Under the dormer sits a massive front window to enjoy the view of the outdoors. The kitchen is spacious with an eat-in island, that also offers extra counter space for prep work and serving. A window above the sink allows for a view into the back yard while working in the kitchen. The adjacent dining room is flooded with natural light and almost makes you feel like you’re eating outside. With a very large window on one wall, and a patio door on the other, this is a very enjoyable space to be. This design is what we call a ‘hybrid timber frame,’ which means the great room and living area is timber frame and the bedrooms are conventional construction. 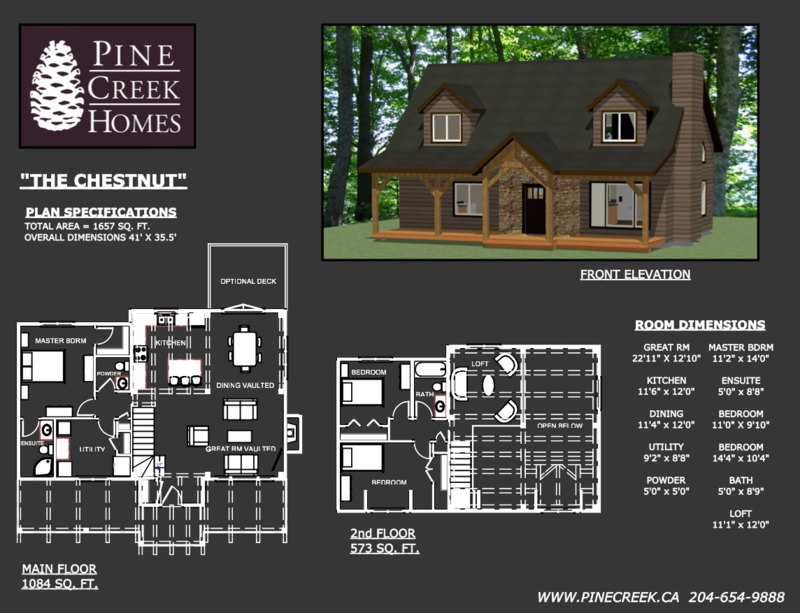 This plan features a main floor master bedroom with ensuite and walk-in closet. The 2nd and 3rd bedrooms are on the second floor, both with large windows and one with a dormer. The bedrooms share a bathroom and walk out onto the 2nd floor loft. Just off the great room, there is a guest bath as well as a large utility room. There is an option for main floor laundry here, as well as a spare fridge or freezer, or just extra storage space. We all know that you can never have too much storage. The use of this room can be customized to suit your needs and may differ depending on whether being used for a cottage or a home.